A gamer's guide to all things Skyrim. Get the Official Skyrim Prima Guide Now! Get the official Elder Scrolls V Prima game-guide now! Save big here, over 40% off list price! Todd Howard and Minecraft producer interview. After reading some game-informer "recent hack attack" news, it seems as though our beloved Bethesda has fallen victim to the recent hacks. Apparently over the last weekend personal information was stolen from the website. It seems no credit card information was taken, but passwords, emails, and usernames were stolen. Bethesda says that anyone owning an account on their sites should immediately change all passwords. Latest Pics From July edition of GameInformer Here! 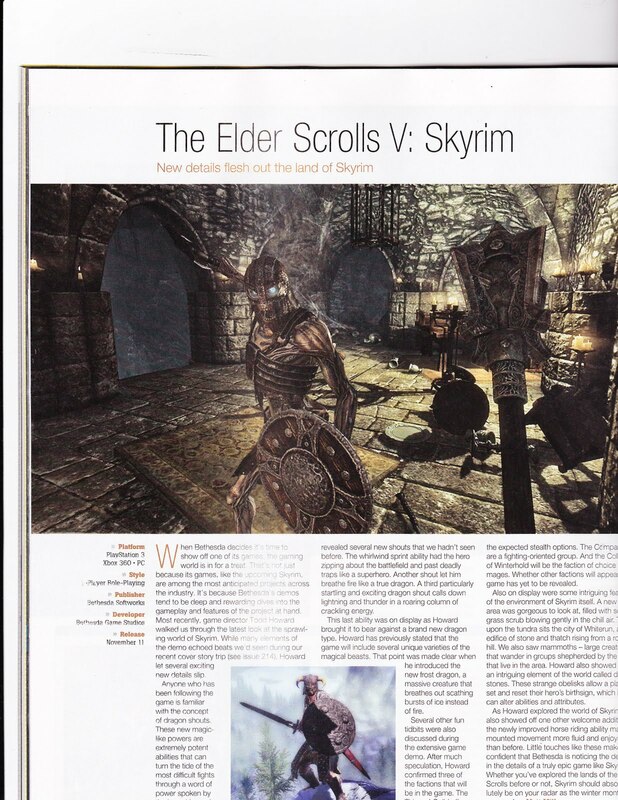 Unfortunately this latest Game-informer issue stated already well known information about Skyrim. However, the issue did have these pics to look at! Thanks to Game-informer for these screenies. PreOrder Skyrim here and Save $5 on the Xbox 360 version! Are you able to be a Werewolf in Skyrim? Can you change form? -We [Bethesda developers] are messing with all that, but I don't know where that’s going to end up, or how deep we'll get into that. We will try it, and see how it goes in the game. How many perks are in the game? -There are almost 300 perks in the game. How are races different in this game? -In the beginning of the game you pick your race, different races have different better skills and different racial abilities Similar to previous games. However, there are no classes. You just play and your skills go up; it kind of self balances itself. Can you edit your players face? -Yes, we have an all new face system in Skyrim. Everything is much better than what it was like in Oblivion. All the races look pretty cool and unique. 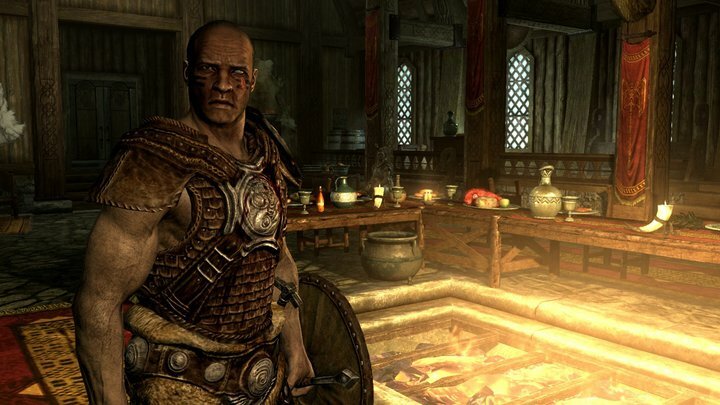 Does your character know that he/she is Dragonborn? -Your character does not know. But there is an event that happens with a dragon where your character finds out that he/she is Dragonborn. The "Greybeards" find out and shout your name and your name rumbles throughout the world. What is going on with the dragons in Skyrim? -The dragons are part of the world; they are fierce beasts that become boss fights in the game. We made a whole team of people working on the dragons who worked on them for over 2 years. There can be multiple dragons in a scene. There are multiple types of dragons. Riding them is probably not going to happen in Skryim. Are there companion characters like in Fallout? 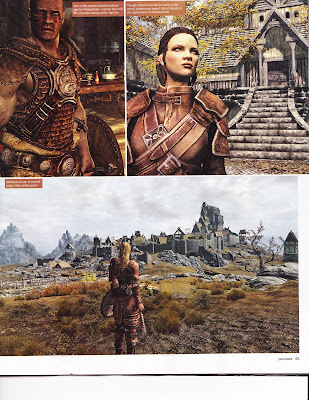 -There are a much much higher number of companions in Skyrim, they will be more dynamic and more types of companions. However, because of the many number their individual character depth and stories are a little less than fallout. How will the game start? -You start the game heading to your execution. You are a prisoner, like the other Elder scroll game beginnings. It's like a tradition. What is the "Radiant Story" in Skryim? -It is a tool that is used to make quests. 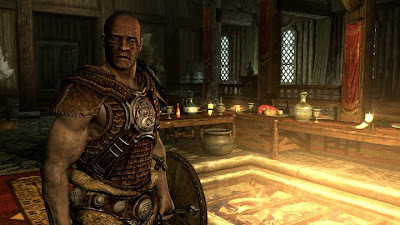 All of the quests in Skyrim are made by the "radiant story" system, it makes the game much more dynamic and personalized. The "radiant story" system is going to challenge the player, making the game funner. For example a person in the world could ask for your help in finding his lost child, and the radiant system will automatically force the Dungeon the child is in; placed in a location you have not yet been to. Will there be mounts available in Skyrim? -Mounts will most likely be in the game, but are going to be overhauled from the Oblivion mounts. The control and The feeling of riding a mount will be much better in Skyrim. We don’t know yet what exactly what you will be able to do With them. Are you going to be able to craft? -Yes, Smithing, Enchanting, Alchemy will be in Skyrim. You can also cook, and do other things that don’t require skills. We don't know about spell crafting yet, but it could be in the game. Will factions be in Skryim? -Yes. There are factions called, The College of Winterhold -for mages, The Companions -for fighters, and the Thieves guild. What aspects of Skryim will appeal to a big fan of Fallout 3? -If you really don’t like oblivion, I don’t know how much you will like Skyrim... Oblivion was more a classic fantasy game, where as Skyrim is much more unique and feels better. Skyrim is grittier and ancient looking. 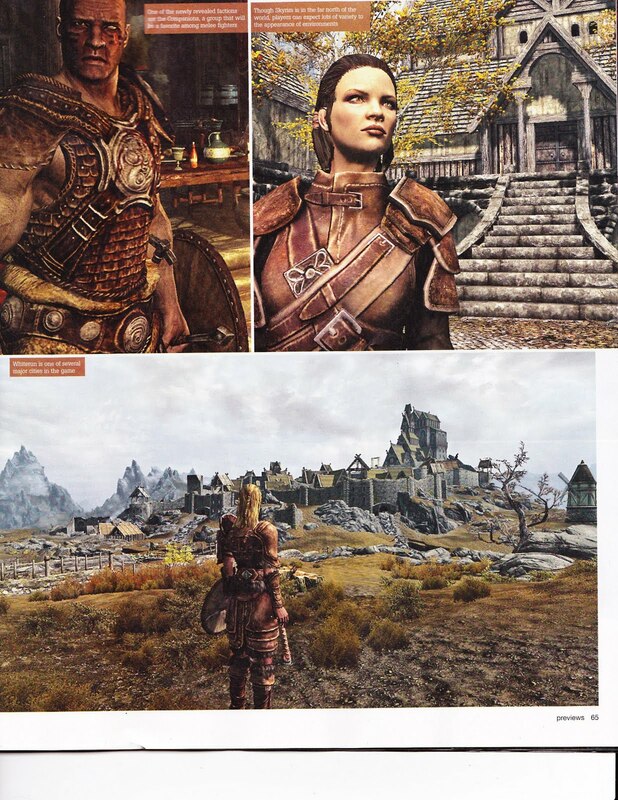 Oblivion made everything look the same, so I do think that Skyrim would appeal more to a Fallout 3 fan. Will Skyrim have different endings? -I'm going to pass on that question; I don't know if I should really tell the end of the game. How expansive is Skyrim in size? -Skyrim is about the same size of land mass as Oblivion, but Skyrim has much more mountains which make the game actually bigger. Skyrim feels bigger than Oblivion. There are over 7 regions that have a unique look, like pine forests to fall forests, and others. Is there an in game HUD for Skyrim? -The HUD comes and goes as needed. There is a small compass bar at the top for direction, your magika health and stamina display only when they need to. If you are just walking around the world, nothing besides the compass will be seen. Are there going to be spears in the game? -There are no spears in the “classic spears sense". Can you talk about some of the weapons in the game? -There is a two handed weapon skill, a one handed weapon skill, and archery. Those are the weapon play styles. There are weapon skills and perks, but not exactly like the perks in Fallout 3. There are "perk trees" and you start specializing as you use the weapons. Spears didn't make the cut. What ESRB is Skyrim going to get? -It will almost surely be rated M. That’s our assumption. We never aim for a game to get a certain rating. The violence in the game is very realistic. Is there any chance that the release date could be changed from 11/11/11 to something else? Will there be an x64 version for PC players? Will there be high resolution textures? -The game is actually made on the PC, and a lot of the team uses PC's all day. I personally use the Xbox when I play. You will definitely have the ability to run VERY HIGH resolutions on the PC version. We are going to support PC use heavily. How will achievements/trophies work in Skyrim? -We want to have a mix of achievements between quests, collections, general game play, and others. Will there be any Kinect support, Move support, or 3d support? -I don’t think that will happen. But there might be something that we do with them. But right now we are focusing on the main game. How will the leveling system work? What is the maximum level? -It works like oblivion. There is no maximum level. There is a max level for your skills though. We made it so you level faster. This one is balanced like 1-50. You level fast in the beginning of the game because of the perks that help you out. The actual maximum could be somewhere around level 75. If you design your game with a 1-25 levels, is sort of slows your game down. That is why we made it possible to level faster in Skryim. 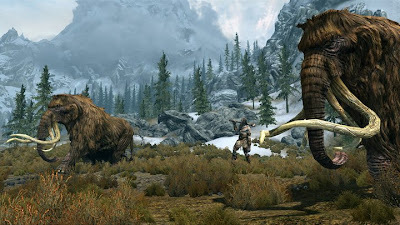 Newest Skyrim Gameplay Video From E3 2011, Over 10 minutes of NEW game play footage! Latest Skyrim Screenshots and Wallpaper here! Click Wallpaper and images to download full size! Bethesda's Epic Skyrim Promo Poster! Note: These are the predicted system requirements. We've all heard about this new engine for the ES V game from Bethesda, but what does this mean about the actual game? And for some of us, what the heck is an engine doing in a video game that doesn't have cars?? With some information from PC.IGN.com, the engine has been explained. It's called "Creation Engine" and it (and of course the game developers) is responsible for the intense level of detail we are expecting in the upcoming RPG. Engines are actually "how" a game is made, providing a way to control physics, sound, animation, memory management, and even A.I.While the geniuses at Bethesda have done wonders with the seemingly lesser previous engines, gamers must also appreciate the abilities of the Creation Engine. So what does a new engine bring to the Elder Scrolls release? Everything from the unscripted dragons (you knew that right?) to the new radiant A.I. to the way the game is just played! Todd Howard told IGN "Because our worlds are so big all of the lighting has to be dynamic. That's something we had a little bit of in the past with shadowing, but not on everything. Now we have it on everything. It just makes the whole thing a lot more believable when you're there." Let's put it this way - with the new game engine, you won't see the A.I. simply walking the same steps back and forth or a sky without birds. Thanks to the improvements of gaming technology, we now have dragons. The latest issue of PlayStation Magazine included a nice amount of fresh information regarding the latest game in the Elder Scrolls Series, Skyrim. The Bounty system has been updated, making the bounties you attain non-global. This means that a crime will only be reported in the city it was committed, unlike the Oblivion crime system. Also, the guards are not leveled extremely high as they were in oblivion, making it possible to resist arrest without being completely obliterated. A new weapon has been confirmed: a torch. Yes, you can now use a torch as a weapon while dual wielding another weapon/item. However, you will not be able to dual wield a torch and any magical item, and the torch will be forced to be the off-hand item. However, there is some seemingly bad news in the new PlayStation article. Bethesda has confirmed that the Hand to Hand skill will be REMOVED. It's sad to see H-t-H go, but in retrospect the skill needed a ton of work in order to fit in Skyrim. The article goes on to talk about how much work Bethesda is putting into making Skryim feel more real. Bethesda is aiming at eliminating the "fake" feeling of the quests like in Oblivion by creating dynamic quests. This means that the quests will revolve around what your character has done and accomplished in the game. Indeed this should make for a unique gaming experience for everyone. To see the pictures released in the PlayStation article, scroll down to the previous posts. Slideshow of ALL CURRENT SKYRIM Pictures available! This is a complete slideshow of all the current photo's and screenies of the upcoming Skyrim game. Sit back and relax! Tell me what you think by adding a comment! 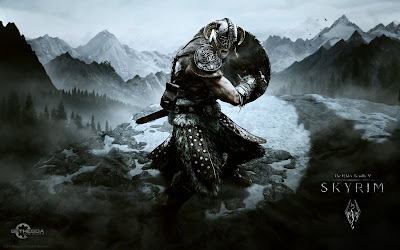 The Elder Scrolls V: Skyrim will be released on November 11th, 2011 on the PC, Xbox 360, and PlayStation 3. After viewing that, it seems pretty obvious that this game is going to be as awesome as we have all been praying for. Not only is it just another Elder Scrolls game, but it's an Elder Scrolls game with DRAGONS! Get the official Skyrim guide here! 40% off! Get The elder scrolls IV: Oblivion! Get The Elder Scrolls III: Morrowind! What console will you explore Skryim on? Main contributors are A.S. and V.M. We'll be keeping you updated on the ES V Skyrim game from Bethesda until 11-11-11, which is when we will be much to busy for internet (or anything else). This website Is not affiliated with Bethesda, and does not take credit for any Bethesda owned items. Theme images by sololos. Powered by Blogger.